>> We are encountering a serious issue collecting film using our Titan (not Krios) with the Tecnai low dose kit. Certain images appear to be severely over-exposed, while others appear to be normal, high quality, low-dose exposures. Here are two examples of images collected during the same session, from the same cartridge of film, one right after another. 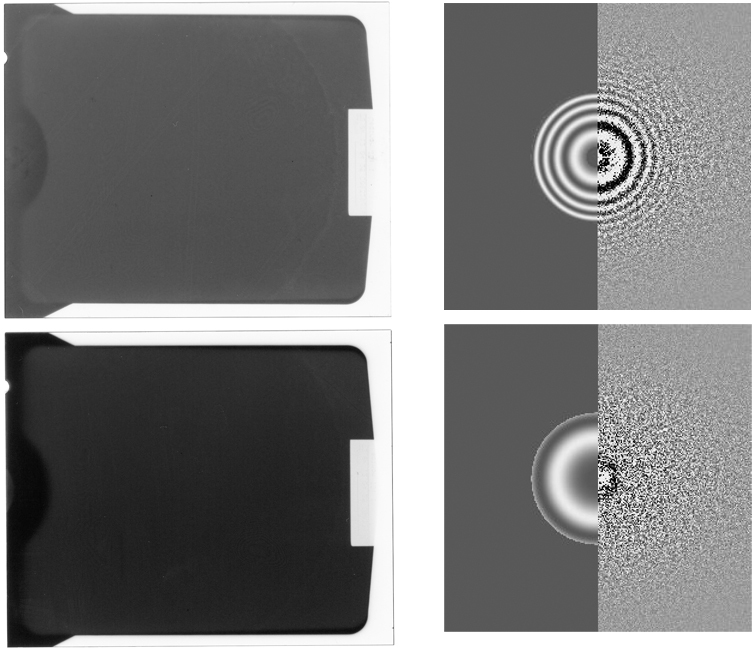 >> The top image is of good quality, exhibits Thon rings to around 5Å, while the one below it has no discernible Thon rings, and is overall much darker in appearance. We can only assume that this is due to overexposure of the film to the beam, but not to the extent that we see obvious radiation damage to the sample (no bubbling). We've monitored the blanker during the exposures, and according to all the readouts in the Tecnai software it is working properly. The film is inserted into the microscope and waits for 10 seconds before exposing the film. Multiple users are having this issue. >> Also, we never seem to have this problem when collecting CCD images. >> If anyone has ever experienced this issue or has any insights into what is happening, we would be most appreciative.